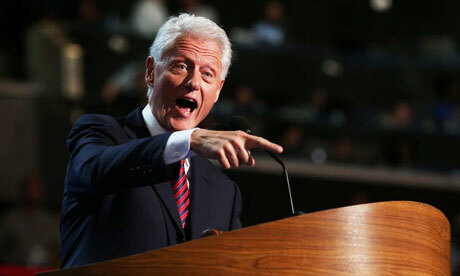 Did you watch the Bill Clinton speech at the Democratic Convention last night? If not, you probably should. If you’re a Democrat you must, because it was a great feel-good speech for us. If you’re undecided, you should because he sets the record straight on many of the attacks (largely unjustly) aimed at President Obama by the Republicans at their convention, and you need to know the truth if you’re going to make a decision. And finally, I think even Republicans should watch. First, it’s always good to know what your opponents are up to and second, you also need to know about the lies and twisted facts being thrown at you by your own party elite. Also, it might scare the pants off you…and it should! One warning though. Apparently the speech was long. I know this because the talking heads on TV told me so when it was done, but frankly I didn’t notice. When Bill Clinton gets fired up–and he was on fire last night–there aren’t many people in the political arena who can deliver a better speech. Let’s pull off to the side for a minute and talk about something that Republicans are probably talking about. The whole Monica Lewinsky thing. I will never condone or excuse how President Clinton behaved, in terms of the affair or the investigation. It was unbecoming of a husband, a father and especially a president. It will forever be a stain on his otherwise amazing legacy. That being said, I’m over it. He screwed up, got caught and got humiliated. That was a long time ago, and it’s time to move on. And all that doesn’t change the fact that he’s incredibly smart, charismatic and an excellent speaker. And–in terms of governing–was a darn good president. He knows his stuff, and he spent 8 years in the office himself, so when he talks about Obama’s performance, he has a great deal of credibility. To paraphrase a bit, he said no president, not himself or any other in history, could dig us out from under the mess the Republicans left the country in just four years. And that the message from the GOP convention was basically that Obama hasn’t been quick enough to fix what they broke, so let them back in. Ha! Sounds ridiculous, doesn’t it? But that’s more or less what they’re saying. Well, that and outright lying. Romney should be worried right about now. He has no “surrogates” (as the media seem to call these people) that can even come close to Bill Clinton. They clearly don’t want to use G.W. Bush, and even if they weren’t keeping him out of sight, Bill would mop the floor with him any day of the week. G.H.W. Bush was a better president than his son, IMHO, but he only had one term and was defeated by…yup!…Bill Clinton. In fact, unless they hire a medium to channel the ghost of Ronald Reagan (they’d reanimate his corpse if they could) there’s no one out there who can compete.